No need to go naked in Omaha, what with all the attention to gorgeous fabric at our local galleries. Anderson O’Brien Fine Art joins the party this weekend with one of its seasonal wearable art shows. From March 5-7, the gallery presents the jackets of Mieko Mintz. Mieko, a Japanese native who opened her first store in New York in 1999, is widely regarded for her mastery using the Southeast Asian art of kantha, a type of embroidery done on stacked layers of vintage sari fabrics. 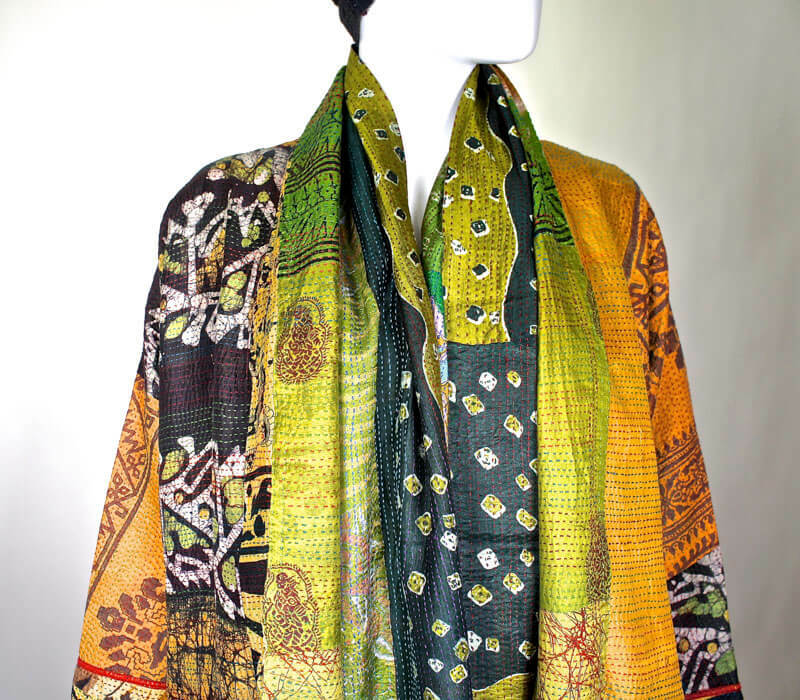 Traditionally, kantha are made into bed coverings and blankets; Mieko takes these simple quilts and reinvents them into jackets, vests, scarves and jewelry. Versatility is a frequent feature of her garments, as many are reversible or may be worn several different ways. This is Mieko’s first showing in an Omaha venue. This event was organized by Anderson O’Brien in conjunction with Anne Fenner Image Management. Later this year, AOB will also present two additional wearable art features. From April 29-May 3, the work of Carter Smith will be on display. Smith is known for his bias designs and hand-dyed silks using the Japanese tie-dying technique of shibori. He works from his studio in Nahant, Mass., and has been innovating draped bias designs for more than 47 years. October 6-8 brings the artistry of Susan Neal, based in Albuquerque, New Mexico. Her hand-woven garments are colorful and textured; their computer-aided patterns are developed in conjunction with her partner Steve Thurmond. Anderson O’Brien Fine Art is located at 1108 Jackson Street in the Old Market. Hours for these events are 10am-5pm on the dates listed.